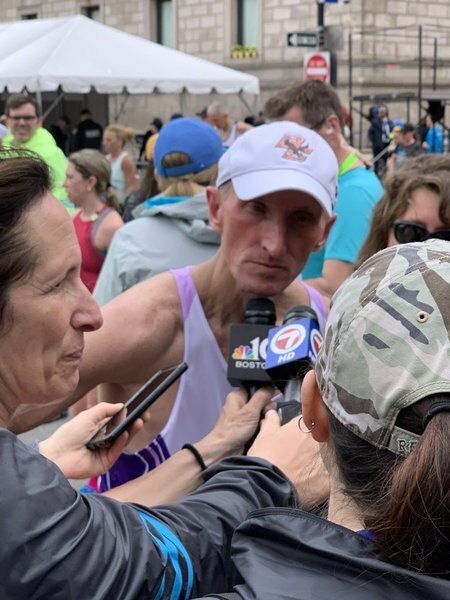 Marathon Update: Top American Scott Fauble on leading the race for a period of time. 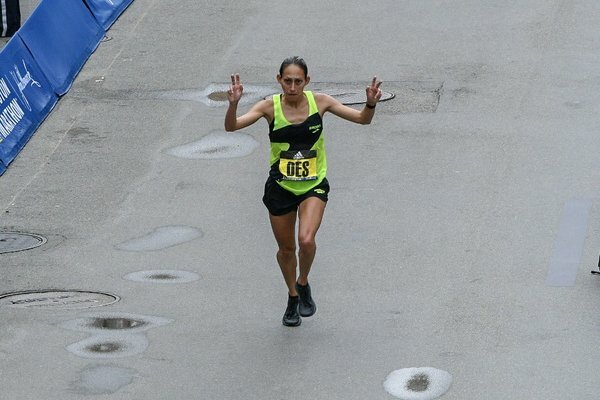 Boston Marathon update: Fifth-place finisher Des Linden on her legacy in Boston. 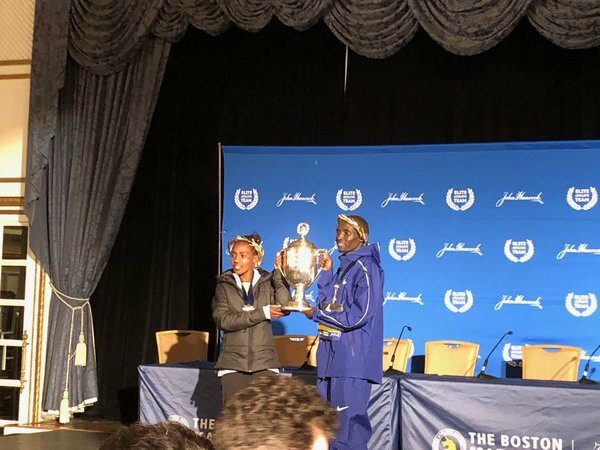 Elite men's marathon winner Lawrence Cherono: "So grateful to be in Boston. My race today was so fantastic because... I kept on focusing, and at the end I emerged the winner. I'm so grateful and so happy." 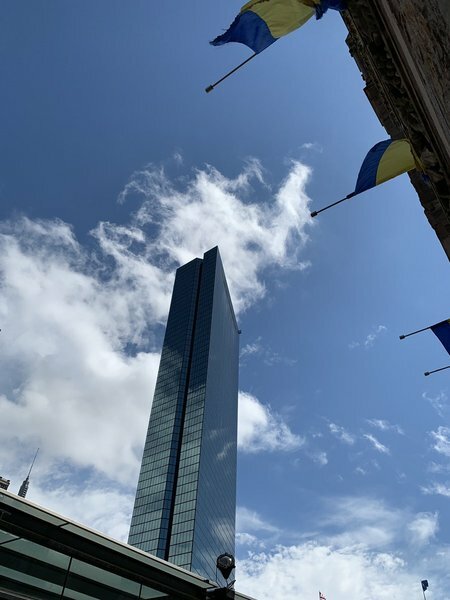 “So grateful to be in Boston. 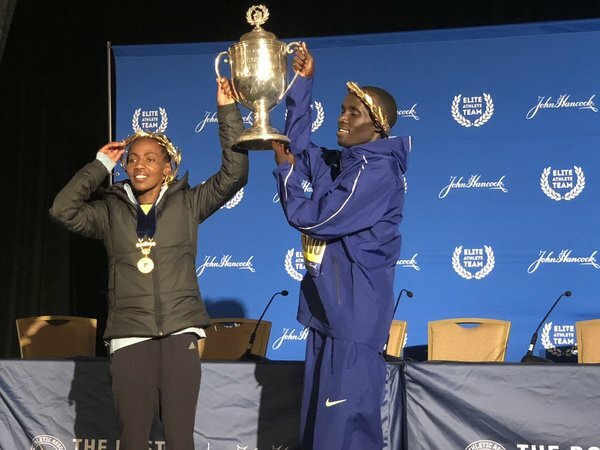 So happy,” Boston Marathon winner Lawrence Cherono said. 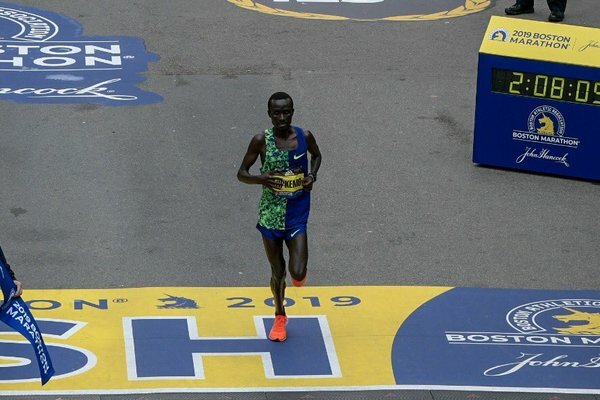 This was his third time racing in the United States. The other two races came in Honolulu. 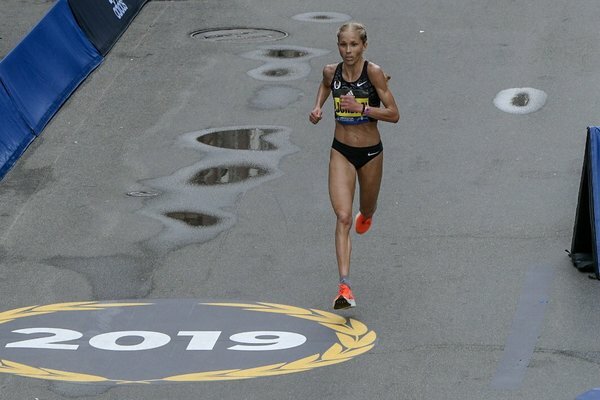 Top American women finisher Jordan Hasay on Olympic qualification: "I'm a bit confused myself. I think today if you had top 10 you do get the Olympic standard. 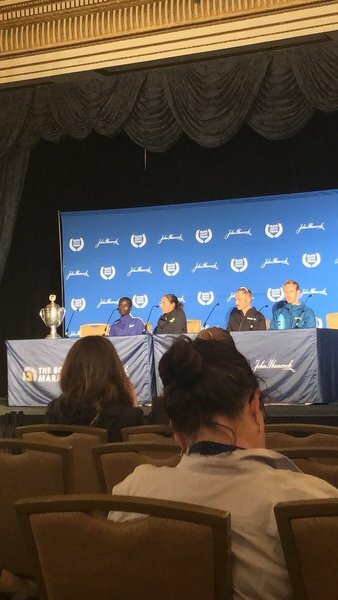 I'm not sure what USA Track & Field has decided at this point. I'll be there for whatever I need to do." 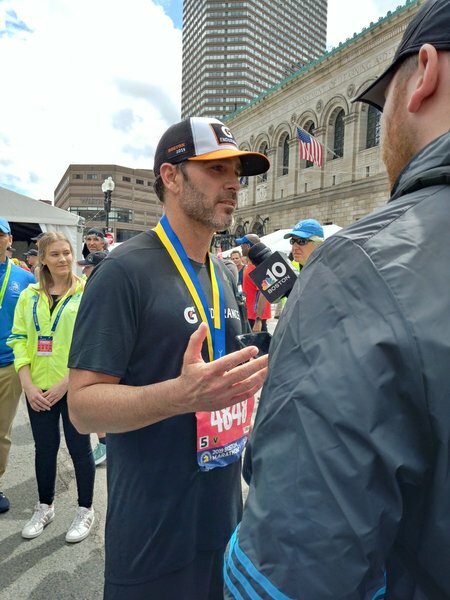 Did you know 7 time Monster Energy #NASCAR Cup Series Champion @JimmieJohnson completed his first full marathon at #Boston2019 today? Talia Viera, 18, of Quincy, stood on Boylston Street with a sign she made for Jared Padalecki and his wife Genevieve, who both star in the TV series "Supernatural." 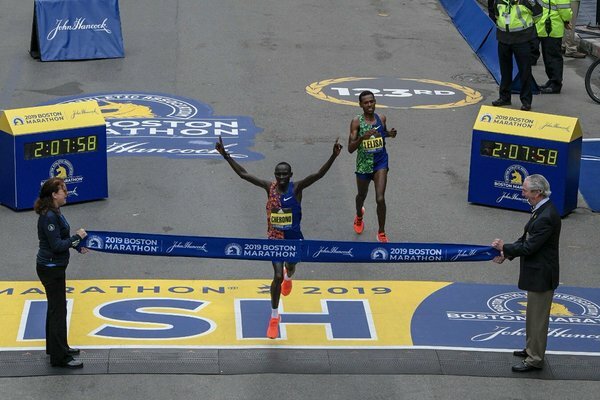 Viera wanted to cheer them both on as they ran the Boston Marathon. 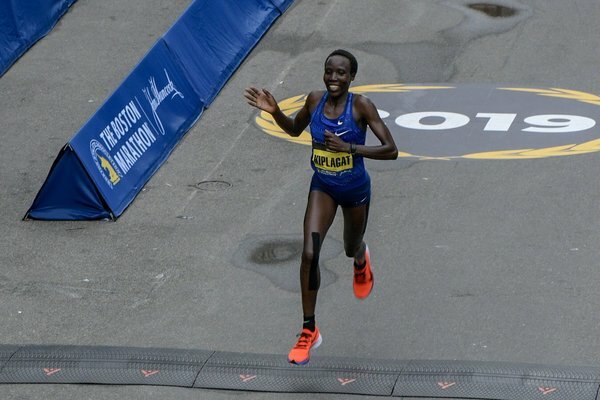 She was impressed by the enthusiasm of the crowd, and by the fact that spectators on both sides of Boylston Street were cheering loudly for each and every athlete, no matter who they were. "It's like a big community event," she said. She was also relieved that the sun was starting to come out. 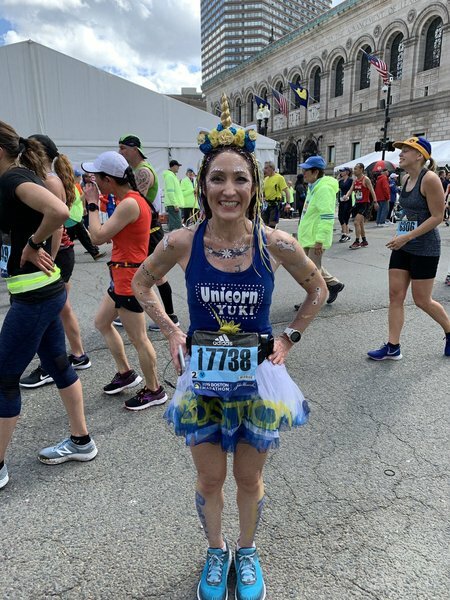 This is her first Boston Marathon. She's happy she got the opportunity to witness the historic race before she leaves for college in the fall. "I'd never been before," she said. 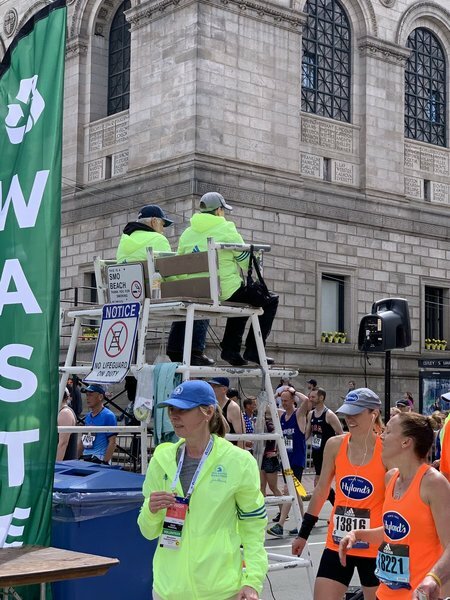 Wellesley College students lined the Boston Marathon route as it passed their campus, leaning over a temporary fence to present their faces to runners willing to spare a second to give them a smooch. 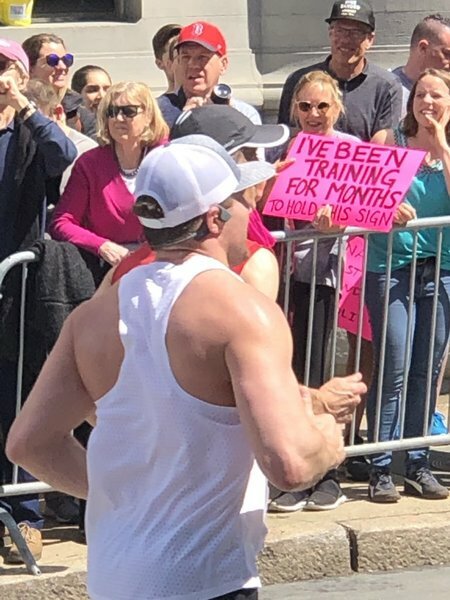 They held signs that ranged from earnest ("Kiss me, I build robots"), to disturbing ("Kiss me if you're chaffing"), to downright risqué ("I like your stamina. Call me"). 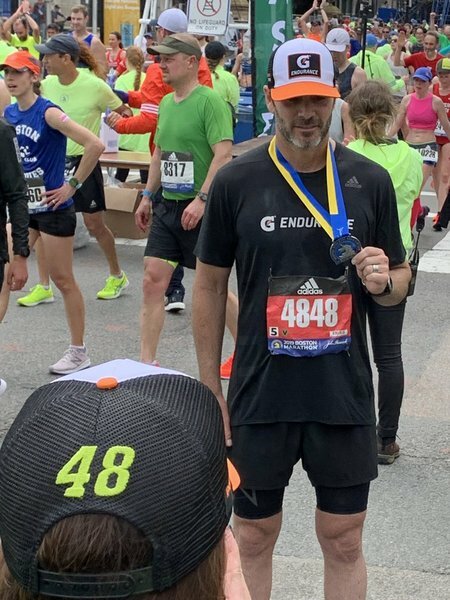 And many of the runners obliged, stopping for a friendly peck. 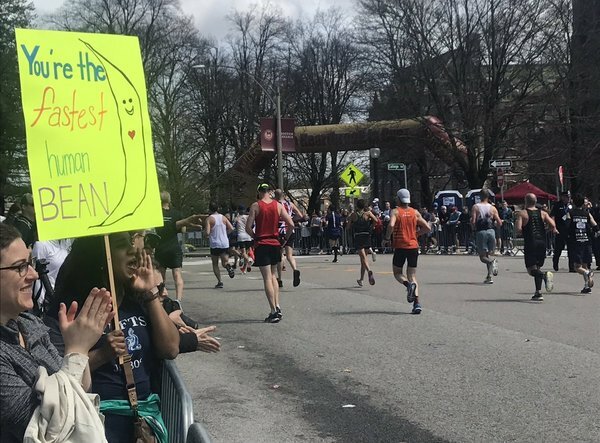 The decades-old "Kiss Me" tradition is a core part of Wellesley's legendary "scream tunnel," in which students line the halfway point of the race to loudly will the competitors onward. 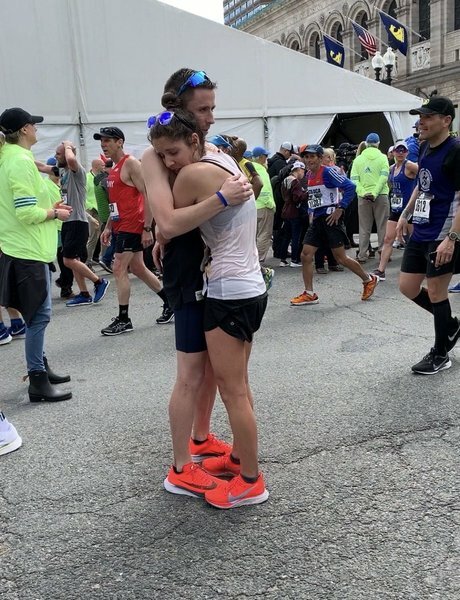 But some of the spectators this year were sending a different message: Don't kiss me. 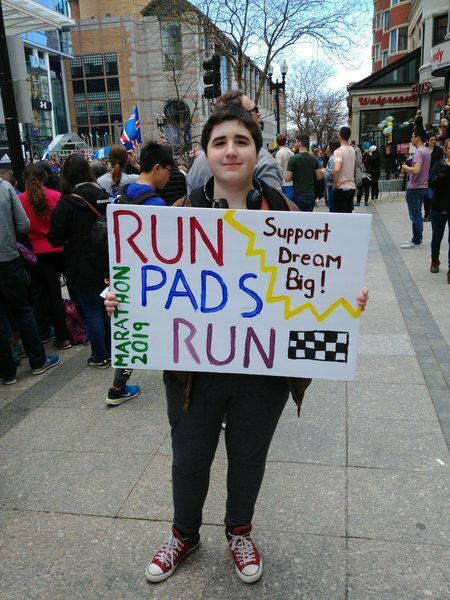 "Keep running," read a sign held by Isabella Tighe. "Cuz I only love my bed & my mama. I'm sorry." The message is a play on a song by Drake, and in its lighthearted way it got her point across: "I'm in a relationship this year," she said. "and I'm not going to be giving kisses." Other students were accepting kisses, but not from just anyone. 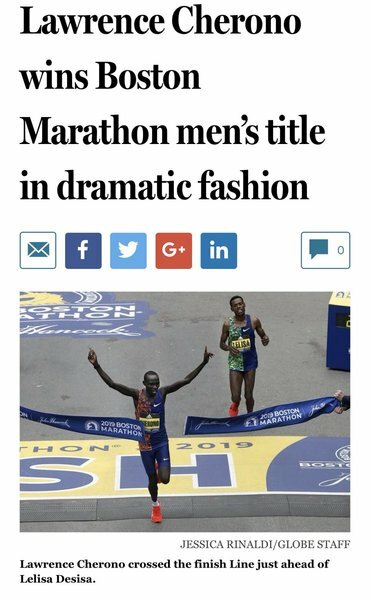 "Kiss me only if you're over 6 feet, have a 401K, are secretly a prince, can speak six languages, can cook, will agree w/ everything, I say, handsome, nice to my mom, nice to my dog, & OVER 6 FEET," read a sign held by Deavihan Scott. 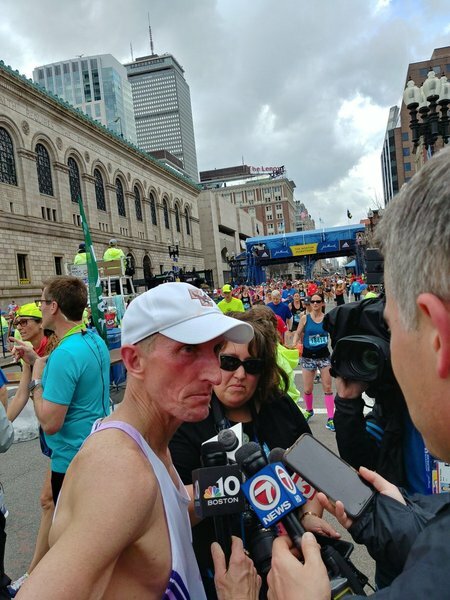 And down the road, Gillian McGuire had a somewhat deceptive message: "Kick me." The senior said a few people had tried to kick the sign, though by noontime nobody had connected. Most of the people didn't read it closely enough, and tried to kiss her instead. 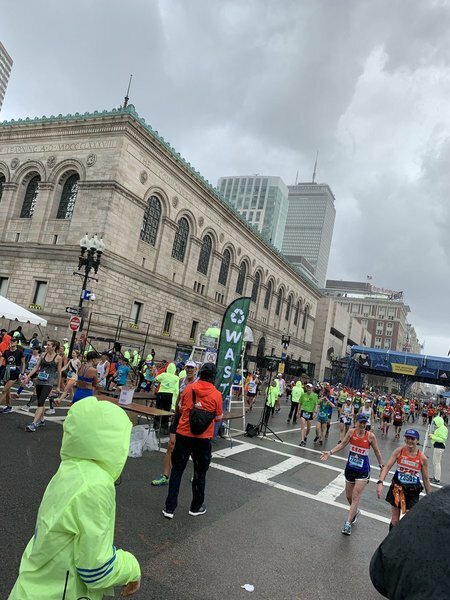 Chisan Chan conducted the Brookline Community Band earlier today by Mile 24. “It’s the first time I’ve played, since last year it rained out and we had to cancel. I was watching the news all last night and decided now was our best bet. We’re so lucky it’s dry,” Chan said.